That’s a whole lot of cheddar. It has been 18 months since the release of Fire Emblem Heroes for mobile devices. Since it’s first year, it has made over $300 million dollars for Nintendo. Six months after, it has now accrued over $400 million, according to the data from SensorTower. This is shared between the Apple store and Google Play, with the majority lies with Google at 52%. 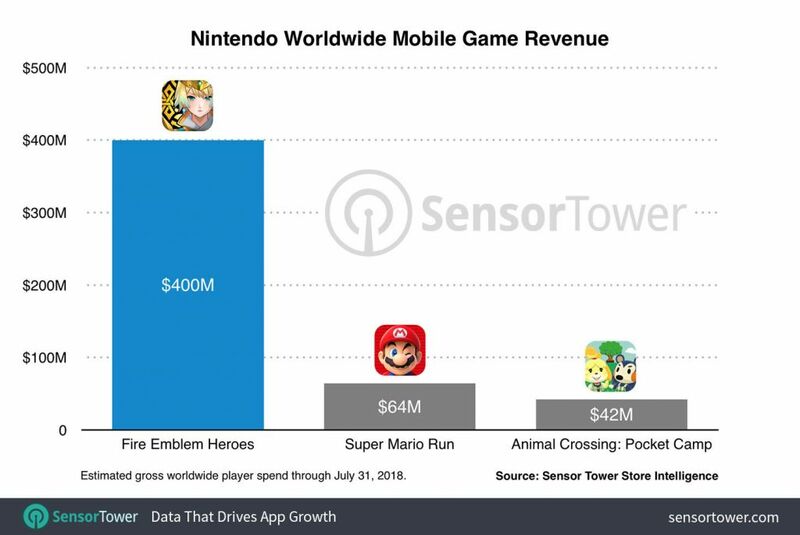 For perspective, Fire Emblem Heroes is by far the most profitable app that Nintendo has released as compared to Super Mario Run or Animal Crossing:Pocket Camp. Super Mario Run has made $64 million since release, and Animal Crossing:Pocket Camp has made $42 million. Needless to say, Fire Emblem blows the other two out of the water. Other stats show that the majority of players of 65% resides in Japan, while the next largest user base is the U.S with 22% . On average, the app has made $20 million a month. During the month of June, it has made $23 million, put it as the most second most earned month since release. I wonder how much I and my fellow cohorts of the Nintendo Entertainment Podcast has contributed to this?